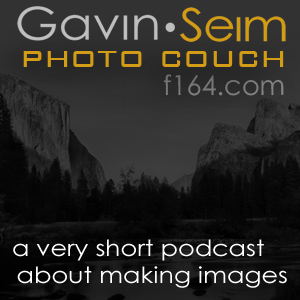 Photo Couch is the companion podcast of Gavin’s f164 project, made for photographers. Nothing fancy here. Just short musings, tips and thoughts on photography from Gavin. You can listen below, or subscribe for free to get all the latest episodes. Since f164 is the new official home of the Photo Couch podcast, I though I make a post with all the back episodes so I have them safely archived away. You can find 01-18 below. You can download the mp3 files, or play the directly using the play button to the left of each link..
Photo Couch #017. I Cleaned My Sensor With Tape. Photo Couch #016. Bring the Glorious Questions. Photo Couch #015. Ginormous Family Portrait. Photo Couch #014. Getting Prepared. Photo Couch #013. Know Our Craft. Photo Couch #012. 03/13/10 Pitfalls of a Newbee. Photo Couch #011. 03/08/10 Stepping out in B&W. Photo Couch #010. 02/11/10 Shooting Groups. Photo Couch #009. 12/28/09 How to Print BIG. Photo Couch#008. Seeing Your Site with Client Eyes. Photo Couch #007. 09/30/09 Branding Your Prints. Photo Couch #006. 09/04/09 Proofs & Sales. Photo Couch #005. 08/18/09 Live Shoot Follow Up & Proofing. Photo Couch #004. 08/13/09 Senior Session Live Shoot. Photo Couch #003. Of Phones and Websites. Photo Couch #002. Reception Sideshows. Photo Couch #001. Gear Prep & Hyperdrive. Photo Couch #000. Intro to Photo Couch (photo Minute).